Despite its relatively small size, Estonia displays a great variety of forest types. Forests cover about 50% of the Estonian territory, which is around 2 million hectares. That makes the forest an important and dominating landscape type in the country. According to the Estonian Ministry of Environment, the national policy recognised that forests are a natural and ecological resource. Meanwhile, national environmental policies recognise that forests are also important in an economic, social, ecological and cultural aspect. This seems to be is not truth anymore. Estonia is currently lobbying in Brussels, which would result in the loss of a quarter of all forests in the country. A shocking statement appeared on the internet very recently, stating that Estonia’s logging volumes have almost tripled in the past decade. And predictions for the near future are even worse. Because of this development, the European Commission expects Estonia’s forest to become a net carbon source by 2030, rather than a sink, as it is today. The tripling of logging volume conincides with a report from ETV’s “Pealtnägija” which shows that the State Forest Management Centre (RMK) and €1 billion pulp mill planned pulp mill developer Est-For Invest have struck a deal guaranteeing the yet-unbuilt mill half of the State Forest Management Centre’s pulpwood over a 15-year period. Critics of the deal see this as a conflict of interest or even prohibited state aid. State Forest Management centre also manages most of the Estonian protected areas for the Estonian Government. A warning comes from conservationists as the scars of clear-cuttings, showing the commercial demand for wood, are already visibly changing the landscape. 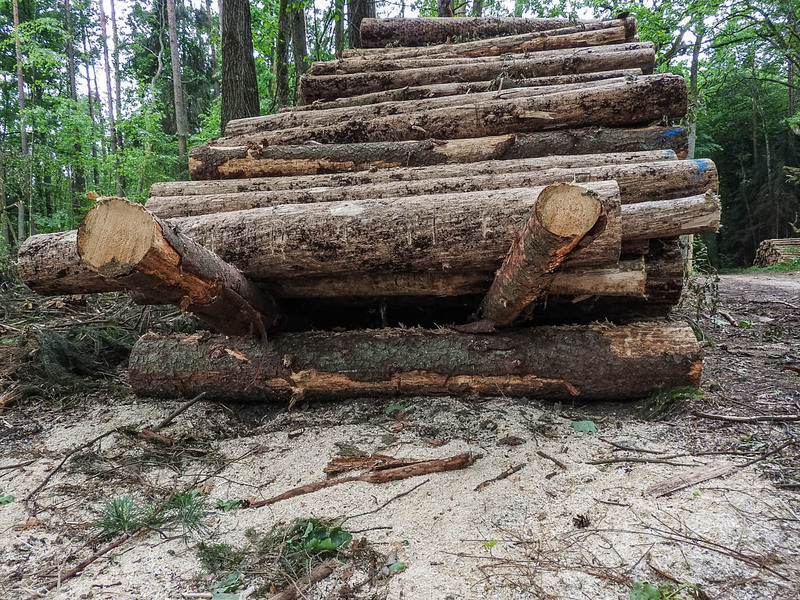 Further on, the recent news revealed that the representatives of this Baltic state already lobbied for flexibilities in EU rules to enable further dramatic increase in logging. More on this can be read here. Romania is famous for its logging of national forestry heritage: old growth forests inherited from their grand parents. Talking about clearcutting, they are more effective then during the period of Ceausescu. In Bulgaria, logging is already in the vicinity of Word Heritage Site that border the Pirin Mountains. It results in harvesting of old growth forests, which even survived the devastating period of communism. In Slovakia, there is almost nothing left to harvest if we speak about conifer forests in Tatra and Low Tatra Mountains National Parks. On the top of that, the government is refusing any discussion on this matter with the representatives of the non-profit sector, which gain mandate of more than 70.000 supporters. In Ukraine, the process of logging the Carpathian forests is in fully ongoing. Harvesting companies use 20 years of logging experience from collecting in the former eastern European countries. In Poland, Europe’s largest old-growth forest, Bialowieza Forest is threatened by ongoing logging operations, despite Court orders. In Finland, systematic logging operation, named sustainable forestry, made the boundary between Finland and Russia visible even from outer space. This is due to large scale clearcuts and the removal of remaining trees on the Finnish site of the border. To manage a forest and have everything under the control, resulted in forests that were divided in plots. That makes a forest well accessible due to a dense network of forest roads. The forestry concept is saying that a forester’s task is, beside forest protection, also to produce timber. The concept of forest protection is based on the rule that if anything happens in forest, which goes beyond current foresters knowledge, an action is needed. Events connected to natural forest dynamism are not always fitting to the present forestry text book. Impact of wind, snow, and bark beetles are simple not the right scenario. If any natural disturbance occurs, common in a natural forest, harvesters and an army of loggers run to ‘save’ the European forest. It seems that our hunt for natural resources is intensifying. Just look what is happening throughout European countries. It seems that Estonia is the next in line.